As Peter Schjeldahl put it recently in The New Yorker, the sale of SALVATORMUNDI for $450,300,000.00 "suggests that money has become worthless." 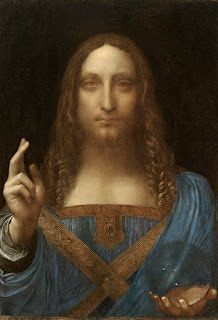 It's an interesting notion, and makes for a new understanding of priceless art. Also interesting is the speed with which Mr. Kahn was able to generate this puzzle. It is certainly convenient that LEONARDODAVINCI's name has exactly 15-letters, but with the 13-letter artwork name providing such a beautiful crossing, he seems to have been forced into a mix of vertical and horizontal thematic material, which, as some of you might remember, is something I quite like. OLDMASTER is good, but its symmetric partner RESTORING (10D: Eliminating the effects of wear and tear on, as was done to 38-Across) I like less. I've spent a lot of time with conservators, and I've seen enough "restoring" to question the whole endeavor. Some in the art world fantasize about a day when all the art in every museum could be magically shown as it would appear without any restoration. Most pieces from the Renaissance and before, including this one, would have huge sections of missing paint. And when you think about all that re-painting, you wonder who the artist really is. OK, art rant over. Where was I? 1A: Either of the World Series winners of 2004 and '05 (SOX) - C.
Best: the "First name in s/Solo flying" pair - AMELIA/HAN. That very much amused me. Worst: I guess I'll go with YEE (29D: "____-haw! "), although it's not awful. I enjoyed some of the clues today: "Pot thickener" (ANTE), "First name?" (ADAM), and "Lie on one's back and not move, maybe" (PLAYDEAD), for example, but there was kind of a lot "meh" material, too. It's basically a stunt puzzle, and a pretty decent one. I guess that's enough today. Big fat Did Not Finish because I had hEE instead of YEE. Given the cross here, that doesn't seem great. Liked the theme, and answers like OHENRY. I might have thought I'd be tired of that answer by now, but obviously not. Oh and nice clue for ADAM. As soon as I saw that, I changed cOlA to -ODA and then to SODA. Oh, and nice supplementary theme material with ART, SOHO, OIL and ERA. Definitely a stunt puzzle. You forgot the shoehorned in theme material of CHRISTIE and CHARLESI. But not a terrible example of such. This one went right along with just a slight slowdown as I'd entered dRyAD instead of OREAD at first; I can never get those nymphs straight. Not much to HARPON or REACTSTO too strongly. Mazel TOV! Exactly the same time as Horace. I only avoided the HEE-HAW trap by the fact that I've seen (Anita) ODAY in a few of these puzzles before.